Laptops, smart phones, and tablet PCs have made today’s business owner more mobile than ever, but life on the go also makes it more difficult to stay organized, be productive, and focus on promoting one’s business. 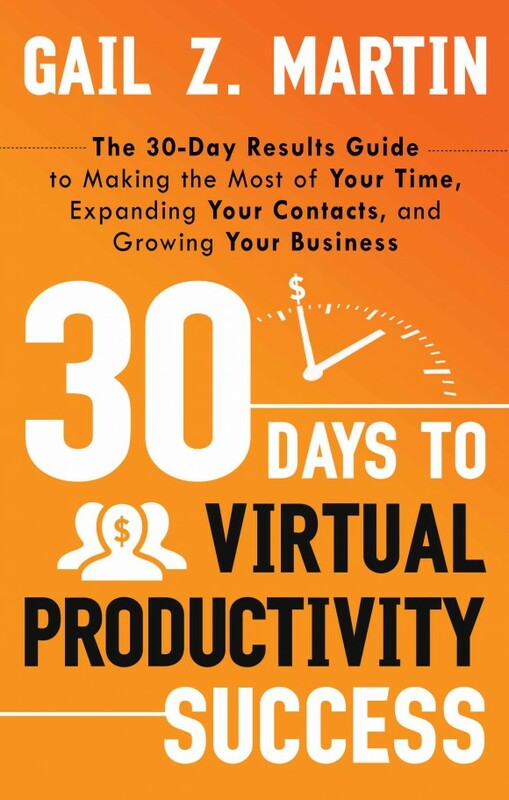 30 Days to Virtual Productivity Success is the busy business owner’s guide for getting more done with less time, making productive contacts online, and using the power of the Internet to turn productivity into profits. It’s an easy-to-read, quick-to-implement resource to maximize time and effort. Author Gail Z. Martin has a 26-year marketing career with extensive experience in virtual and traditional promotion. Her unrelenting travel schedule has made her a whiz at managing her personal and professional life with online productivity tools. Using a short chapter/quick exercise format, 30 Days to Virtual Productivity Success introduces you to the 30 Day Results System. Thus armed, you’ll discover a wide variety of online and mobile programs and applications to boost productivity and increase visibility. 30 Days to Virtual Productivity Success is a perfect next step for those who have read the first two 30 Day Results Guide books, but it is an easily accessible and a powerful tool for those just discovering the series. As a small business owner myself it isn’t always knowing what you need to do to grow your business, it’s often setting aside the time to write out a formal plan and committing to execute it. Today that often includes keeping up with your digital world which includes your clients, potential clients, and often times your ongoing marketing activities as well. In 30 Days to Virtual Productivity Success Gail Martin guides you through the process of taking charge of your virtual business activities in 30 minutes per day. As you get into the book you’ll probably find yourself wanting to spend more than 30 minutes on this, and personally I’d set aside an hour. Bottom line, 30 Days to Virtual Productivity Success is a must have for any business owner. Latest Holiday Gift Guide Additions!